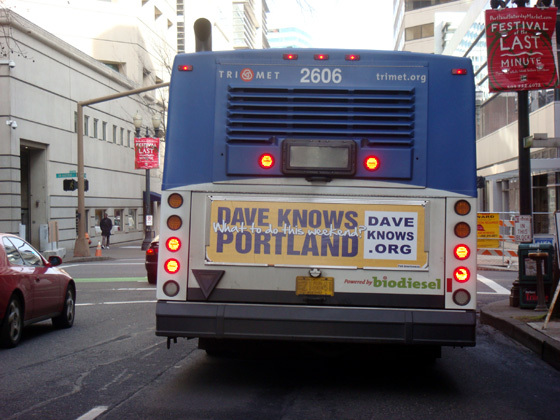 Heather had not given me a single clue as to what she was getting me for Xmas, but then this morning I received an email from a friend telling me that another friend had spotted a Dave Knows Portland ad on the back of a TriMet bus. I knew only one person could be responsible for this! I guess this means I have to get something nice for Heather! You’re welcome! You’re the best boyfriend ever! funny. i saw that this morning and thought to myself (after reading your blog for ages), he’s getting really big! congrats, and what a sweet lady! Best. Gift. Ever. You’re a lucky guy, Dave! Heather – that’s funny because you’re the best girlfriend ever! What a cool idea. How on earth are you ever going to match this for “best gift ever”? Man, you are SOOOOO screwed! From now on, you’ll have to do whatever she wants, for the rest of your life because once she give you that “dude-I-bought-bus-ads-for-you” look you’ll be a goner. Merry Christmas! Cool! I saw one today on a #4 bus — actually two of them on two #4 buses, but then, they do look a lot alike those #4’s. Well played! Hey Dave. Not sure if you saw it or someone told you about it. But, the other night during the Blazers game they were showing the typical scenes of Portland when coming back from a time out and they were following a bus across one of the bridges and your ad was on the back of the bus! Must have been on for a good 5-10 seconds. Pretty cool. A link to this popped up on FB today. Weird.